Who doesn’t love The Hunger Games? An incredible story about injustice, rebellion and hope – the whole series will have you on the edge of your seat! 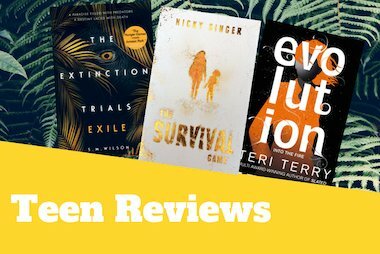 If your teen loves the series, why not try our recommendations? Try James Dashner’s smash-hit Maze Runner series: the knock-out dystopian fantasy that’s conquered Hollywood. Unlock the mystery of the maze, and explore the dark secrets behind it. In this tense dystopian novel, migrants are forced to perform in a brutal circus act. But who’d watch a show like this? Answer: rich people like Ben, the teenage son of a brutal politician. But on his first trip to the circus, Ben falls for a performer. This was not part of the plan. It’s 2099. The Arctic ice has melted and the oceans have risen. The land is rapidly vanishing under storm-tossed waves. The tiny island of Wing, where Mara lives, is shrinking. There’s no choice about it: her people must escape. Leo might be human, but he’s no Earthling. He’s never even set foot on his home planet. He was born and raised with twins Orion and Libra on the Moon 2 Space Station. They’ve had a strange and unique childhood. But they’re not kids anymore. Now it’s time for the trio to make their first trip to Earth. John Green is one of the most talked-about YA authors today. His award-winning novels really resonate with teens. So what should they read next? Did you know that John Green has recently released his hotly anticipated latest novel? The story starts with a fugitive billionaire and a cash reward for finding him. Question is: where will it all end for troubled teenage sleuth Aza…? Have you seen the film? The book will take your heart on a wondrous rollercoaster ride. Born with a terrible facial deformity, Auggie has been taught at home all his life. Now he’s going to school. He’ll have to expose his face to the world. Will anyone see past it? You can plan parties. You can plan careers. But if you know how to plan falling in love, please let Lexi know! This wonderful, witty romantic comedy has been hailed by Meredith Russo as ‘the ultimate love story for the age of the fandom’. If they haven’t already seen the new Harry Potter play, the script is the next best thing! Being Harry Potter was never easy, and that’s not changed now that he’s all grown up. These days Harry is an overworked employee at the Ministry of Magic, with three school-age kids to provide for. But while Harry grapples with a past that refuses to stay where it belongs, his youngest son Albus struggles with the weight of his dad’s great legacy. Imagine if you could travel through the eras of J. K. Rowling’s Wizarding World! What would you pack if you were going to 1920s New York? What kind of beasts would you imagine finding in Newt’s case? What do you think it would be like to study at Hogwarts School of Witchcraft and Wizardry, or to fight Lord Voldemort in the Battle of Hogwarts? A trip to a frost fair in long-ago times. A child kidnapped by a modern-day snow queen. Snow dragons, elves and pied pipers. Dreamy, magical writing by authors you’ll love. If you’re into fantasy fiction (and Christmas), grab this wintry collection. We love this fantastic series! Geek Girl made it cool to be a nerd and we couldn’t be happier. But what to read next? Oopsie! Bella’s the goddess of digging big holes for herself. Quick: somebody throw her a rope! Right now, our favourite Queen of Awkward is in a pit so deep it pretty much reaches Down Under. One love disaster is unfortunate. But a row of them looks awfully like carelessness! Why do Avery’s dates never work out? Avery might be popular in school and romance. But that doesn’t mean she’s remotely successful. Ugh: a diary clash. We all know what it’s like. Still – it’s never been this crazy! Yup, the word is out. The huge Homecoming game, the class president election and the inter-school Academic Battle are all happening THIS FRIDAY. How could this even happen? It’s your fave daydream come true: the unknown girl picked from millions to star in Hollywood! Seriously: this is so totally lush, why would you even bother to ever wake up?